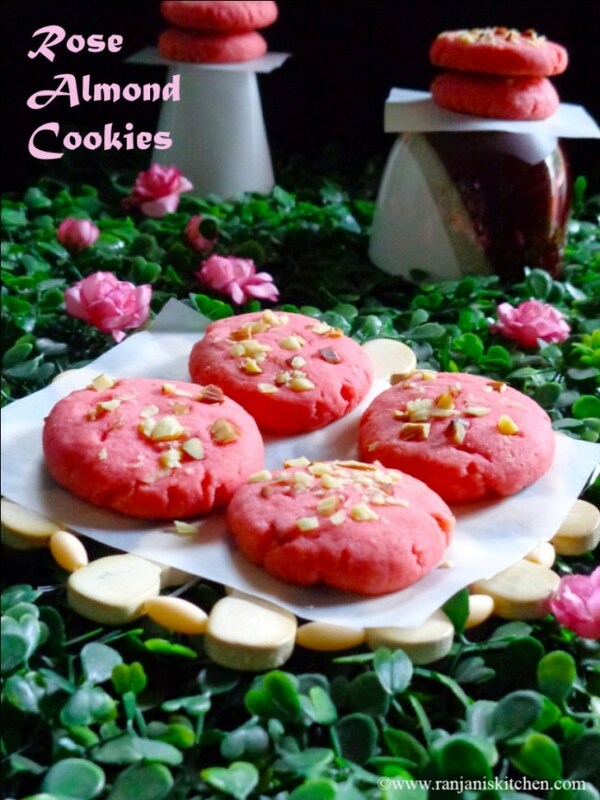 Rose Almond cookies – Eggless Cookies – It’s Christmas season so want to try some baking stuffs. Anyways, am not versed in baking, but started some. 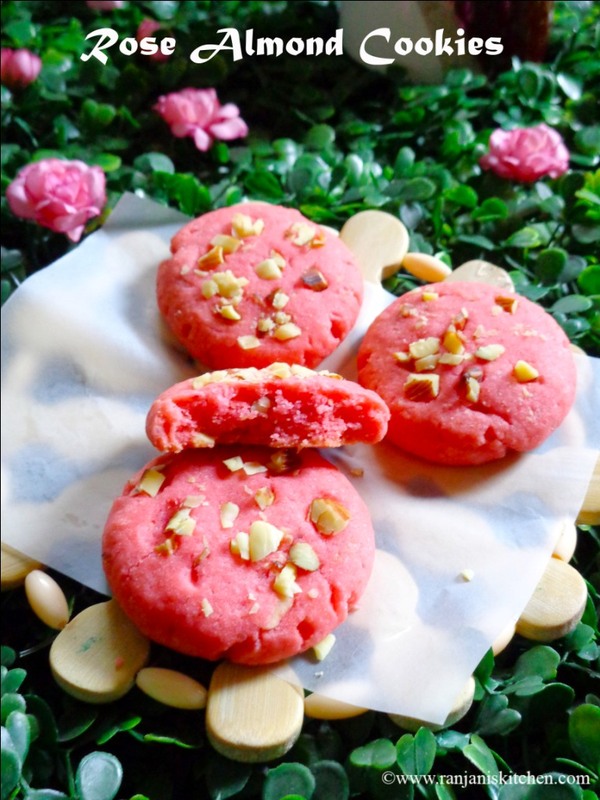 These Eggless butter cookies are rose flavored with almond touch. Most of the rose flavored bakes can be prepared with rose petals. But I tried with rose essence, it was so good with some crunchiness of almonds in it. Preheat the oven to 180 degrees for 10 mins. Grease a baking tray with butter or spray some oil and keep aside. In a bowl, add sugar and softened butter , whisk well till the sugar completely dissolves and becomes frothy and fluffy. Add rose essence to this mixture and whisk for one minute. Sieve Maida flour once to remove the impurities and add it to the beaten mixture. Mix and add 2tbsp of broken or crushed almonds and knead to a soft dough. If the dough is in breaking consistency, add little milk and make it as soft dough. Pinch small portion,roll it as a ball and give a firm press, shape it on sides.Dress the cookies with remaining 1 tbsp of broken almonds. It will easily stick to the cookies as the dough is very soft. Place them on greased plate with one inch gap between two cookies as it will expand while baking. Place the lower wire rack in the oven, keep the baking tray over the rack. Bake the cookies for 15 to 17 mins at 180 degrees. After 17 mins, take the tray from oven and arrange the cookies on wire rack and cool it for 15 mins to firm up. The cookies will be soft while it is hot, after it cools down, the cookies become firm and crispy. Every oven has different temperature, so if your cookies start browning at lesser time, adjust the timings. You can use a parchment sheet or aluminium foil over the tray after greasing. Check the cookies after 15 mins, if you feel still its raw, then bake for 3 more mins. loved ur rosey almond cookies..perfect for this holiday season..